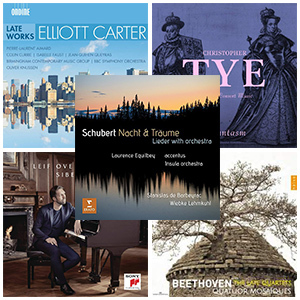 Sibelius, Schubert, Beethoven, Christopher Tye and Elliott Carter feature among the editorial team's individual picks of 2017. Leif Ove Andsnes is one of the world’s leading pianists, and winner of the BBC Music Magazine Award for Recording of the Year, 2015. His new album is a personal selection of Jean Sibelius’ unknown and remarkably beautiful piano gems. It has a magic of its own which Andsnes casts equally, with his pure-source sound and range of colours, over early, middle and late Sibelius. The crystalline cascades of the Impromptu that launches the CD, No. 5 in B minor, could be French impressionist, but the tenor melody is very Nordic – and it’s a preferred range for themes in many of the pieces on this disc…Pure, atmospheric sound by Sony captures the necessary intimacy which is an Andsnes hallmark. His taste and cultivated musicianship have come together to promote an aspect of Sibelius’s output that has customarily been regarded as not worth the bother...His advocacy is strong and pitched just right, and I’ve been won over willingly...Sibelius was a giant and all the tracks here contribute to our knowledge of him. The playing is magical and sensuous, bringing out a myriad of colours, all captured in superb sound by Sony Classical. All appear worlds away from the raw splendour of the symphonic works. Or perhaps not...On closer listening you feel a door to Sibelius’s mysterious world has been unlocked. And the playing is beautiful.